I ordered Shure Step for my 90 year old mother so she could get inside our minivan easier. Most other steps I saw at the store, etc were not tall enough or too tall or were not wide enough or had handles, etc. I had a plastic toy container that I turned upside down and I was using for her to step up into the car with; however, it was not sturdy or slip proof, and it was about 5 inches in height and she could use another inch in height to help her into our vehicle so I was looking for something around 6 inches. I had previously done a search on the internet and nothing was suitable. I later went in and put a search for—6 inch step stool for elderly and your product came up. It is the only one out there or on the internet that I saw which would fit the height (6 inches), width and length that I was looking for. 5 inches is 1 inch too short and 7 inches would be too high so hopefully this will do the trick. 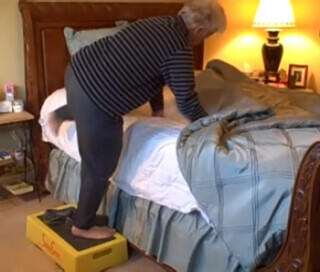 Trying to get a loved elder in your family moved to & from home or to a doctor’s office for a visit can be a bit of a trick if your loved one has trouble lifting their feet very high. We tried to make the Senior Step user friendly for those with limited physical mobility or those that are visually impaired. The 6 inch height is just about right for those that have a hard time bending their knees very far. And as this person points out the top surface is large, 24” x 14”, and easy to see because of the black & yellow colors since most of our elderly have poor or impaired visions. So they can’t accidentally get a foot caught under it.